01:30:00 Makes 16 servings, one slice (90 g) each. Makes 16 servings, one slice (90 g) each. 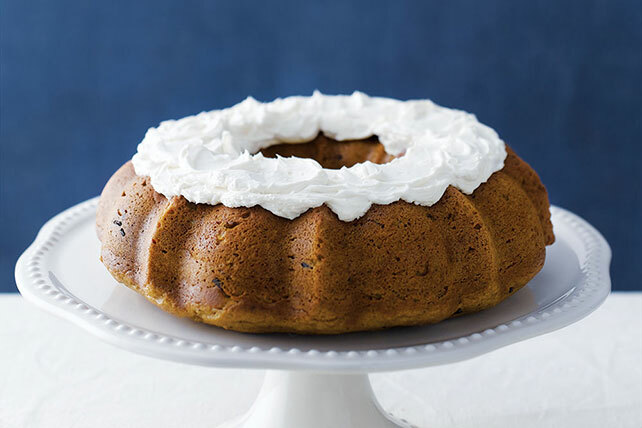 Pumpkin, chocolate and spices unite to turn a boxed cake mix into a thing of beauty. Bake 40 to 45 min. or until toothpick inserted in centre comes out clean. Cool 10 min. Remove from pan; cool completely on wire rack. Mix remaining cream cheese, whipped topping and sugar until well blended. Spread on top of cooled cake. Cut into 16 slices to serve. Substitute yellow cake mix for the spice mix for a less spicy version. Serving Size Makes 16 servings, one slice (90 g) each.